​We are located in downtown Ithaca on the famous Ithaca Commons amongst a great number of family owned retail stores and restaurants. You can find us right in the center of the commons on the north side. We are across from the Home Dairy building (Mate Factor) and directly in between Mansour Jewelers, Bloom/Mia Restaurant. 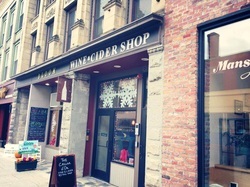 Look for the GIANT words " WINE & CIDER SHOP" on our marquee above the store. Call us at 607-319-0500 or use the form below the map to drop us a line.